I've long since thought that being the lead singer for a band would be weird. First of all, one would need the confidence to get in front of people and perform. Then, when it came time to make a music video, the singer would be called upon to become an actor in some form. Obviously, if you can sing on-stage, you have enough confidence to put on a show, but how many singers were prepared for the transition to actor, even if it just for a few minutes? Clearly there are some who are comfortable with this challenge, as many have made the leap from singing to acting in films. If someone can carry a music video, then they can carry a movie, right? Well, that all depends on the movie, and if it's something like Monster Dog, no amount of acting can save it. Monster Dog introduces us to rock star Vincent Raven, played by real-life rock star Alice Cooper, via one of his music videos. We then see Vincent traveling with Sandra (Victoria Vera), Frank (Carlos Santurio), Marilou (Pepa Sarsa), Angela (Pepita James), and Jordan (Emilio Linder) to his ancestral home to shoot a new video. Vincent hasn't been there in years and along the way, he runs into the sheriff (Ricardo Palacios), who remembers Vincent and warns him that the area is dangerous due to packs of wild dogs. An old man who is covered in blood (Barta Barri) also gives the group a sinister warning. Vincent and his crew finally reach the castle-like house, only to find it deserted. Soon, howling can be heard in the distance and an angry mob arrives at the door. Monster Dog comes from Director Claudio Fragasso, here billed as Clyde Anderson, and I should have turned and ran when I saw that name. Fragasso has been involved in one way or another in such movies at Troll 2, Hell of the Living Dead, and Rats Night of Terror. Those all seem like masterpieces when compared to Monster Dog, as this looks like something a group of complete amateurs have put together. 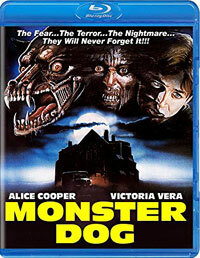 Despite the fact that I watched Monster Dog and wrote the above synopsis, I'm still not sure what it's about, as there is so little story here. When taken in total, the movie feels like the first half of a film which should be longer. (Although, thank goodness that it wasn't.) The screenplay is credited to Fragasso, but apparently Roessella Drudi is guilty of contributing to this as well. The movie presents us with Vincent's group, the angry mob, and the dogs, but these characters are given very little to do. Vincent looks at some books, some characters wander the house, and then there's a gunfight (I'm not making that up). The implied story here is that Vincent's family is a line of killers and the mob is here to spoil his homecoming. The even more implied story is that Vincent is a werewolf who can control dogs. That actually sounds like a cool idea. I wish that they had made that movie. Instead, we get very little story and a poorly-made movie. The editing is very sloppy. The music video has unnecessarily quick cuts which are clearly supposed to mimic what was happening on MTV at the time. However, later on, scenes just go on and on with no clear path. The acting is outrageous, as the emotions are all over the place. The characters either over-react or under-react to everything. For some reason, despite the fact that Alice Cooper speaks English, he's dubbed in this version, so those who are here solely for Cooper won't get to hear him. The special effects are questionable as well. Just witness the scene in which what is clearly a mannequin gets shot in the head, followed by a shot of the actor flailing around with fake blood dripping from his pate. The final insult comes at the end. Following a very unsatisfying conclusion, in which the story simply screeches to a halt, the movie ends with a nearly 3-minute montage which recaps the entire film for some reason. Old man rant alert! Back before things like Netflix changed the world, I would go the video store, typically with just enough money to rent one movie. I would see Monster Dog on the shelf, but could never pull the trigger on it. Was it the odd cover art where the transformation is going in the wrong direction? Was it the fact that Alice Cooper doesn't appeal to me? Whatever the reason, I can tell you now that little Mike would have very disappointed that he'd spent his money on that movie. The quick glance of the titular monster that we get is intriguing, but otherwise this movie is a mess and Monster Dog is a very accurate title. Monster Dog doesn't care if the monster looks nothing like the actor on Blu-ray Disc courtesy of Kino Lorber. The film has been letterboxed at 1.85:1 and the Disc contains an AVC 1080p HD transfer which runs at an average of 37 Mbps. The image is somewhat sharp and clear, showing a mild amount of grain and some mild defects from the source materials. The colors look OK, but they are quite muted. The image is overly dark at times, but this may be due to poor lighting conditions in the movie. The picture is notably flat, not showing the depth we usually get from Blu-ray Disc. The Disc carries a DTS-HD Master Audio 2.0 track which runs at 48 kHz and a constant 1.8 Mbps. The track provides clear dialogue and sound effects. The track offers a somewhat canned sound, as the dubbing competes with the sound effects. The dialogue comes through clearly, never being drowned-out by the music, but it sounds very artificial. For such an obscure movie, the Monster Dog Blu-ray Disc contains a few extras. We begin with "Lord of the Dogs", 43-minute documentary which examines the making of the film. Containing interviews with Director Claudio Fragasso, Executive Producer Robert Bessi, and Writer Rossella Drudi, this is a surprisingly detailed piece which digs deep into the production of the film. Fragasso and Drudi do the bulk of the speaking here and they include many anecdotes from the making of the film, with both being somewhat honest about some issues on the set. The Disc contains twelve DELETED SCENES which run about 14 minutes. These were clearly sourced from a Japanese (?) version, as there are burned-in subtitles. Most of these are simply extended versions of scenes from the finished films. We get three TRAILERS for the film and a STILL GALLERY.